Bukit Lawang and the Lake Toba – this journey covers all the major highlights of Sumatra including volcanos and great mountain views. 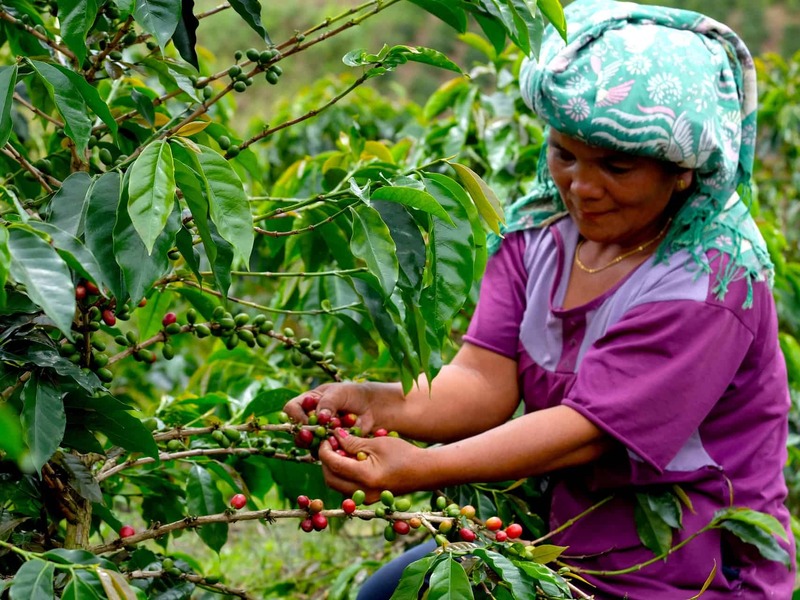 Along the way you will stop at beautiful spots in the Karo Highlands – amongst them are the fruit market in Berastagi, a traditional Batak Karo village and the water falls of Sipiso-Piso. But it still doesn’t stop here! 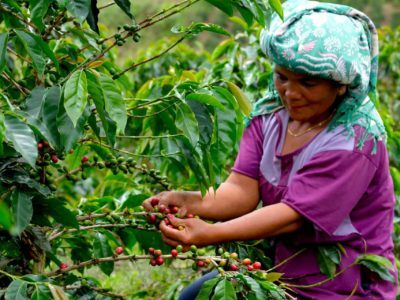 On Samosir Island a discovery tour will take you to unspoiled areas with many indigenous plants where you can also learn about coffee growing techniques. The town of Berastagi offers a refreshing break because of its pleasantly cool alpine climate (1400 m above sea level). The landscape is dominated by two active volcanoes: Mount Sibayak (2172 m) and Mount Sinabung (2417 m). The surrounding green fields produce a variety of fruit, vegetables and flowers for all of Berastagi District. 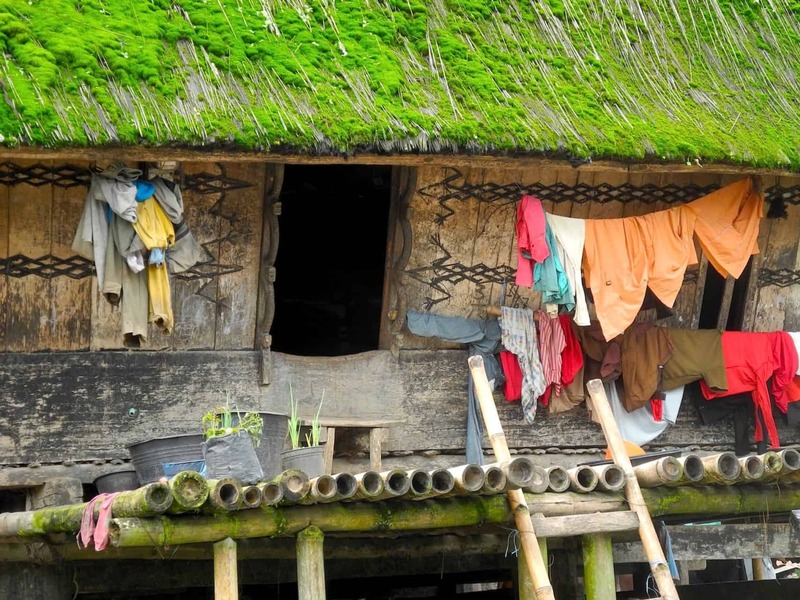 The Karo Highlands are home to the Karo Batak people, a friendly ethnic group, mostly Christian. But a trip to North Sumatra would not be complete without a visit to the world’s highest and deepest volcanic lake – the beautiful Lake Toba. This idyllic lake has a depth of over 450 m and was formed by a volcanic explosion around 75.000 years ago that created a spectacular caldera with wonderful landscapes. Samosir Island in the middle of the lake is the world’s fifth largest lake-island. 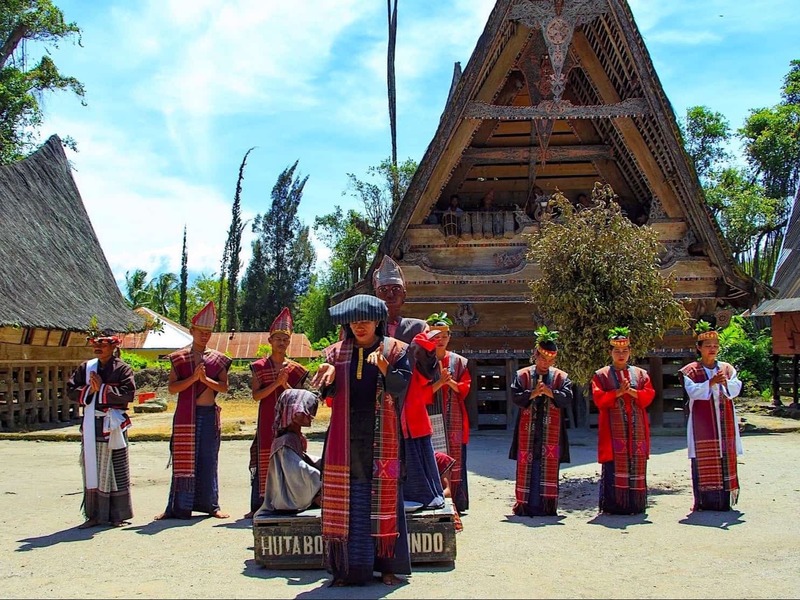 It is home to Sumatra’s friendly Toba Batak people, who love music and singing. Expect a chorus of “horas” (welcome) greeting you! 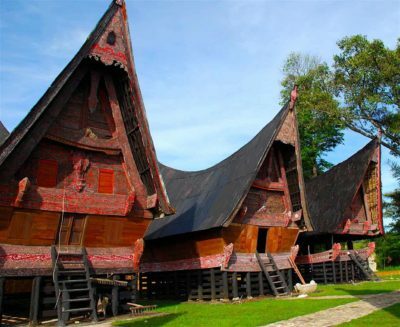 Their traditional houses and historic places are an attraction for the Region. Beaches at the Lake Toba are lined with pine trees and scenic mountain slopes surround the lake. It’s a perfect place to lay back and relax, swimming and biking are other popular options. Don’t miss a traditional Batak dance at the cultural center in Simanindo and the historic Batak king’s residence at Ambarita. Many people who go to Lake Toba plan only to spend a few days there, but often those days turn into weeks! Karo Highlands and Lake Toba can be enjoyed as part of our packages Sumatra Highlights, Jungle Fun & Local Life, Orangutans & Elephants and Sumatra Holiday XL.